In August of 2005, I saw this Tiny Checkerspot (Dymasia dymas) butterfly fluttering in a flowering Velvetpod Mimosa (Mimosa dysocarpa), and so I took a quick photo of it and moved on to get more photos of the beautiful Velvetpod Mimosa flowers. When I later looked at the photo to try to identify the butterfly, I saw something that I hadn't noticed before. Sadly, the butterfly's fluttering had actually been its death throes. 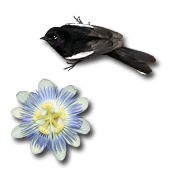 The butterfly had been captured by a white Flower Spider lurking amongst the mimosa flowers. 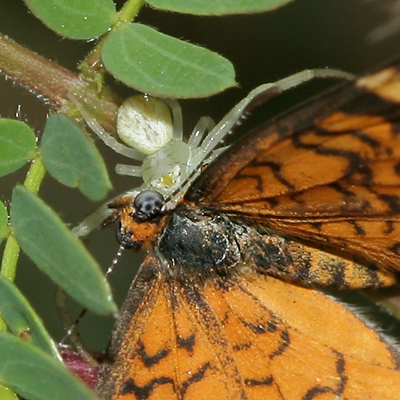 The spider was biting the poor butterfly, injecting it with poison. Flower Spiders (family Thomisidae) are very capable predators and can capture surprisingly large insects. I often see them when I'm photographing flowers, and while most that I see are white like this one, they do come in other colors like this yellow Flower Spider. 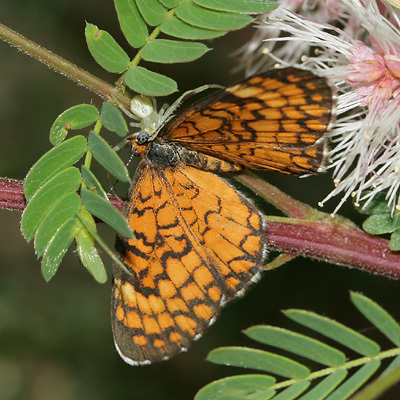 Tiny Checkerspot butterflies can be identified by their dull orange wings with variable, slender, squiggly, dark lines on them and lack of black spots on orange near the edges of the dorsal hindwings, such as can be seen in the similar Tawny Crescent (Phyciodes batesii).